I found this website while searching for places to visit for our holiday in the Philippines this coming March. I think this is a very good idea because in 1 week one can visit a lot of beautiful islands in the Philippines. 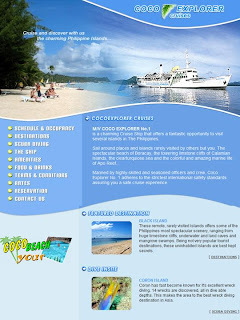 Actually, I've heard about this cruise when I was Boracay and Pandan Island a few years ago. Tourists in Boracay use it to go to Coron. For 100 USD you can get a ride to Coron from Boracay (instead of flying back to Manila then from there taking another plane to Busuanga). Anyway, it is a 7-day cruise that starts from Cocobeach in Puerto Galera, then on the second day the cruise arrives in Boracay then proceeds to the Busuanga Archipelago (Coron Island, Sangat Island , Culion Island) then back to Puerto Galera. For about 700 USD (food and accommodation) per person you can see a lot of places without so much hassle. I don't know if there are hidden costs but if it is like they say it is then I think it could be a good idea. If you have taken this cruise please leave a comment on what you think about it. Ground Floor Baywatch Tower - 2057 M.H. Del Pilar St., Malate Manila, Philippines. You have missed the boat, I am afraid. The Coco Explorer No 1 was sent off to the scrapyard a couple of years ago. This was a big pity because it was an amazing trip. I did it just before they pulled the ship, and was planning to go again.